Equally rich and creamy as it is light and smooth, Swiss Meringue Buttercream is my first pick for frosting. Its silkiness and stability makes it a preferred choice for most pastry chefs and wedding cake makers, but it can be easily made in the home kitchen too. Concerned about whipping egg whites and working with meringue? Well, it’s time to officially kick those worries to the curb and become a fearless Swiss Meringue Buttercream master! If you’ve been reading the blog for a while or picked up a copy of my book, “Layered,” then you know how much I sing the praises of Swiss meringue buttercream. 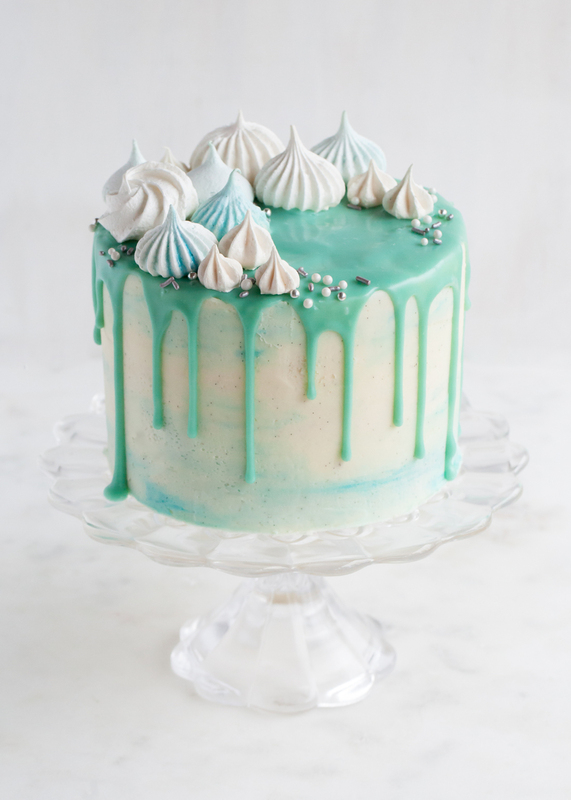 Not too sweet and flawlessly smooth, I opt for this meringue-based frosting 9 times out of 10. I find it extremely versatile and easy to flavor (think coffee, raspberry, passion fruit, mint, and more! ), although plain vanilla (preferably with some fresh vanilla bean seeds) is equally lick-straight-off-the-spoon worthy. 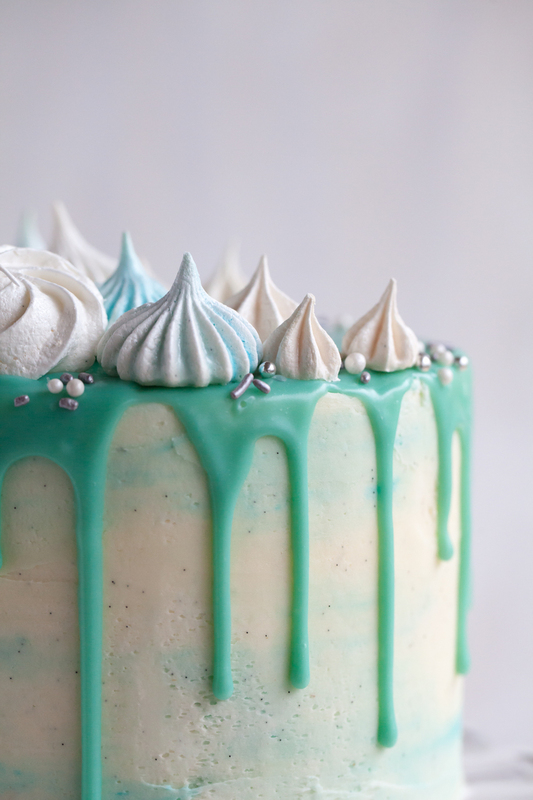 Want effortlessly smooth cakes or heavenly swirls of frosting? This is the recipe you need. 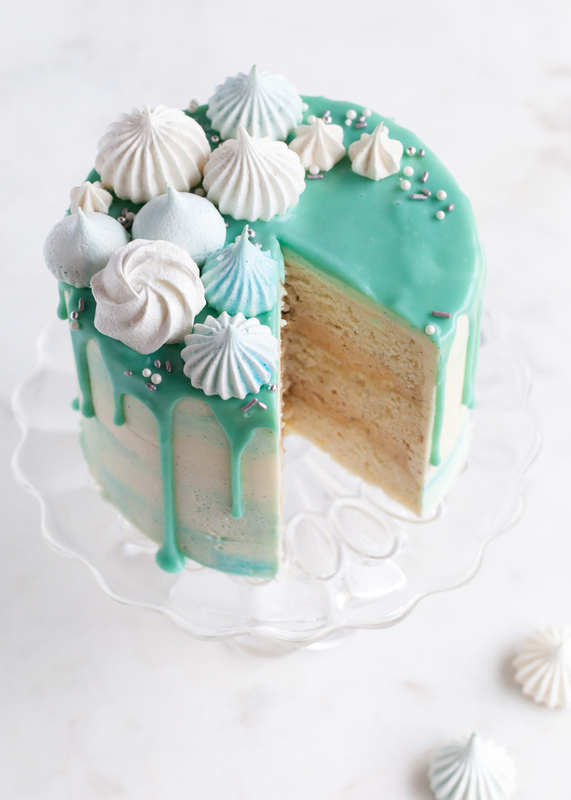 So if Swiss meringue buttercream is the preferred choice for professionals and is so superior in texture and flavor, then why don’t more home bakers use it? Okay, I admittedly don’t know if anything in that last statement is at all accurate, nor in the next, but I think it's the mixing process intimidates many meringue-based buttercream novices. Either that or they hate delicious frosting and love extra work and stress when trying to ice a cake, hehe. Be sure to subscribe to the Style Sweet CA channel on YouTube for more videos and tutorials! Yes, using an electric mixer is nearly a must for making this type of buttercream. And while I am sure you can attempt to do so with a hand mixer, and stand mixer makes the process even easier. Don’t have a stand mixer? Kitchen Aid CA is generously giving away an Artisan Stand Mixer to one lucky winner! Along with a signed copy of “Layered: Baking, Building, and Styling Spectacular Cake,” one lucky winner will receive a brand-new Kitchen Aid mixer (in the color white). Coveted by home bakers and pastry chefs alike, this mixer is a total game changer. I literally could not do my job without it! Scroll down to see how to enter. This recipe can be used exactly as is or as the base to a variety of other frostings. I find that it is not as sweet as most other types of frostings, so it is easier to flavor. For example, you can find recipes using this base for Honey Sour Cream Buttercream for the Honey Apple Cake, Graham Frosting for the Pumpkin Pie Cake, and even Coconut Rum Buttercream for the Coconut Mojito Cake in my book! So many options it is hard to pick a favorite! 1. Whisk together the sugar and egg whites: In the bowl of an electric stand mixer, add the egg whites and granulated sugar. Whisk them together briefly by hand, just until they are combined so that the egg whites don’t begin cooking by themselves. 2. Create a double-boiler: Fill a sauce pan with a few inches of water and bring to a simmer. Place the mixer bowl with the egg white mixture on top to create a double-boiler. The water should be kept at a simmer but should not touch the bottom of the bowl. The double-boiler acts as indirect heat for the egg white mixture. 3. Heat the egg white mixture: Occasionally stirring, heat the egg white mixture until it reaches 155 to 160 degrees F on a candy thermometer. The mixture should be very hot to the touch and the sugar should have dissolved. 4. Make the meringue: Once the egg white mixture is hot, carefully return the bowl to the stand mixer. Fitted with the whisk attachment, beat the mixture on high speed for about 8 minutes. When done, the meringue should hold shiny, medium-stiff peaks and be cooled to room temperature. Stop the mixer and swap out the whisk for the paddle attachment. 5. Add the butter: With the mixer on low, begin adding in the butter a couple tablespoons at a time. Use the paddle attachment to mix it in. The butter must be room temperature in order to incorporate properly with the meringue. 6. Add the vanilla: Once the butter has been mixed in, add the vanilla bean seeds (if using) and the vanilla extract. 7. Mix until smooth: Turn the mixer up to medium speed and mix until silky smooth. This may take a few minutes, but centime to mix until light, creamy, and free from most air bubbles. Tips and Trouble Shooting:The egg whites should be free from any drips of egg yolks. Likewise, the mixing bowl should be clean and free from grease. Any fat (grease or yolks) may prevent the egg whites from whipping properly. If you do not have a candy thermometer, it is possible to test the heated egg white mixture by touch but BE CAREFULL! The mixture is hot enough when it stings behind your fingernail just a bit. When the meringue is done mixing, the outside of the mixing bowl should be room temperature. You should not be able to feel any residual heat escaping out of the top either. If after you add the butter the buttercream begins to curdle, just keep mixing. The butter was most likely too cold and will require more time to incorporate. This process may take up to about 5 minutes, so be patient. Alternatively, you may remove a small amount of buttercream and melt it in the microwave. Add the small amount of melted buttercream to the mixing bowl and incorporate until smooth. If the buttercream appears soupy, the butter was most likely too warm. If this happens, place the mixing bowl (and its contents) in the refrigerator for about 15 before trying to mix again. Storage: The buttercream may use immediately or stored at room temperature for the day. If making in advanced, the buttercream may be stored in an air-tight container in the refrigerator for up to about 10 days or in the freezer for 2 months. Bring the buttercream to room temperature and mix thoroughly before use. CONGRATS AMY! GIVEAWAY IS NOW COMPLETE. Subscribe to the Style Sweet CA channel on YouTube to enter! Thank you to Kitchen Aid CA for the generous donation! Giveaway open to Canadian residents only. Fluffy and tender yet deeply chocolatey, these Devil's Food Cupcakes are truly sinful. The fudge frosting swirls and sprinkles are the quintessential 'icing on the cake' for these all-occasion treats. Now that my book is out, I’ve been really trying to focus on improving my overall cooking, recipe development, photography, and food writing. It’s time to hone in on my photography style, create crystal-clear, workable recipes, and really find my voice. Story telling has never been my strongest suite, but I yearn to improve upon my food writing. (Not so) strangely, I've really noticed that actually the more I write the more comfortable and creative I seem to get with the writing process. I recently considered looking for and enrolling into a food writing course. I found the perfect online course aptly titled “Food Writing” as part of UBC’s continuing education program. However, the course syllabise mostly consisted of tasks that I already do professionally – how to write a recipe, basic food photography tips, how to write a query/book proposal, etc. And by no means do I think I am better than this course, I just don’t think it was made for me (just a few years ago I would have been all over this!!). For me, I think it mostly comes down to "read, write, read, write - repeat" until I find my voice. I was at Barbara-Jo’s Books to Cooks over the weekend for a cake tasting/demonstration and book signing for "Layered" (side note – this shop is every cookbook lover’s dream!!). There was signage on the wall announcing that Dianne Jacob was coming to town later this month. I had heard about the latest edition of her book “Will Write for Food” a little while back, but I was too caught up in editing my own book to give it much thought. Now that I have more time to dive in, I must say that Dianne Jacob is a rock star! I have yet to read the book, but her blog offers a wealth of knowledge for anyone with a food blog or freelance food writing career. Even though I already wrote my book, I know that I have so much more to learn from her and how the industry in continually changing. I can’t wait to hear her talk in a few weeks at Books to Cooks! Speaking of Books to Cooks, I finally picked up the Fall/Winter 2015 issue of Cherry Bombe Magazine. My dear cake pal, Lyndsay of Coco Cake Land was featured in the issue and I had to buy a copy to keep for when she is (even more) famous one day! The issue was titled Eat My Words. I have yet to read the entire issue, but there are some amazing articles covering cookbook, food, and recipe writing from professionals like Ruth Reichl and Melissa Clark. How perfect for where I am in my writing phase, right?! One article in particular that I found informative was a piece noting Food and Wine’s Tina Ujlaki’s top 10 tips for writing a (great) recipe. Some of the tips seem obvious, like make sure to write down and accurately measure your ingredients, but her practices would surely improve accuracy and work-flow. My favorite was her tip to note sensory clues (color, smell, texture) instead of just going off the oven timer. Her last tip was not to overpromise and underdeliver – more specifically, stop using things like “best ever” or other click-bait tactics and let the headnotes talk about the origin of the recipe and why someone should make it. I mostly agree with this statement, but like most everything, there are exceptions. I don’t use definitive terms like “best” and “ever” very often, but it’s true. These cupcakes are the best. Like “no need to look any further for a different chocolate cake recipe ever” kind of good - and rightfully so, as I was on a quest to develop such a recipe. I didn’t have a signature cake that mom made for my birthday each year or a special cupcake recipe that I requested on repeat, but if I did, this would be the one. An American hallmark turned into individual cupcakes, these guys are the ambassadors of birthdays, office parties, potlucks, and backyard bashes. Sorry Tina, but without a doubt, these are The Best Chocolate Devil’s Food Cupcakes ever. Extra moist and superior in deep chocolate flavor, this is the kind of recipe you store, covered in batter splatters, in an heirloom tin for your future grandchildren – even though you’ll probably make it so often that you’ll eventually commit the steps and ingredients to memory. It must be clear that when I say “best” I don’t necessarily mean simple. However, just because the recipe isn’t as quick an easy as my other one-bowl chocolate cake recipe, don’t be confused into thinking this recipe is difficult. While I totally see the appeal of throwing all the ingredients in at once and getting it over with and there are whole businesses committed to such convenience (dump cakes and boxed mixes, I’m looking at you), but sometimes you gotta put in the extra work for the superior taste and texture. I’m only talking a couple extra steps and few more dirty dishes – don’t worry. It is difficult to pinpoint the exact difference between a Devil’s Food Cake and a regular chocolate cake, but I find that typically a Devil’s Food Cake is made with butter instead of oil and has the addition of coffee or instant espresso powder to bring out the chocolate flavor. Older recipes call for unsweetened, melted chocolate squares, but many of today’s recipes opt for the convenience of cocoa powder – which incidentally has a more intense chocolate flavor. Opposite of an airy Angel Food Cake in both name and flavor, Devil’s Food Cake also gets its name from a sometimes slightly reddish tint (think red velvet cake), due to the alkalizing effect that the baking soda has on natural (not Dutch process) cocoa powder. – Mixing the cocoa powder with boiling water first allows the chocolate flavors to bloom and intensify instead of adding it in with the other dry ingredients. – For the butter, make sure it is extra soft. Since we are not relying on the cream of butter and sugar for lift and airiness (that’s what the baking powder is for here), I just popped it in the microwave for a few seconds until it was almost melty. – I used a full-fat coconut milk for extra flavor and tenderness, but any milk should do. – I used jumbo cupcake liners and made about 16 cupcakes. I bet the recipe would yield about 20 to 24 using standard liners. Adjust bake time accordingly. – I prefer my fudge frosting to be very soft (but still spreadable). When mixing, the frosting should create a well in the center of the mixing bowl instead of clinging to the paddle. The sprinkles should be able to stick easily and not fall off immediately (if so, the frosting is a bit dry and crusts too quickly). 9. Evenly divide the batter into the cupcake pans and bake until done, about 22 to 24 minutes (see Notes). 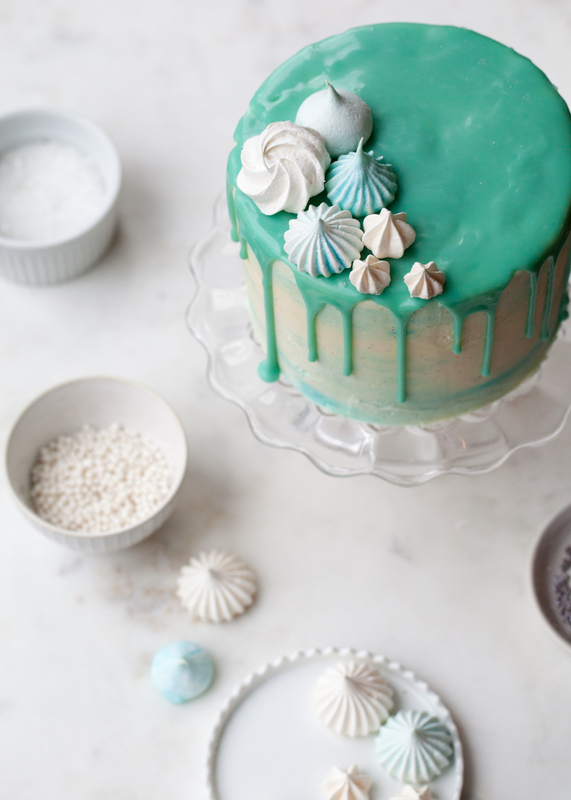 A step-by-step tutorial for creating a delicate, two-toned ruffled buttercream finish. Create these perfect petal details for a romantic, whimsical cake for spring!. In honor of my new cookbook being available for pre-order, I wanted to create and share a brand-new cake decorating tutorial. If you love this, then I think you will really enjoy my book! For those of you who don't already know, the book is called "Layered: Baking, Building, and Styling Spectacular Layer Cakes." The subtitle is a bit long, but it really illustrates all that the book entails. It is 288-pages packed full of color photos, decorating tips, industry tricks, and about 150 delicious recipes. For spring, I wanted to create a ruffle cake that resembled flower petals. Instead of the popular zig-zag ruffle cake, I flipped the piping tip 90-degrees and went with a horizontal ruffle. Using a petal tip, I was able to make delicate rows of ruffles, each one resembling a flower petal. Instead of tinting the buttercream a solid color, I decided to stripe my piping bag – painting a bit of pink and coral buttercream just on the side where the narrow end of the petal tip would be. This way, each piped petal would be two-toned! Of course, I could have stopped there, but why not throw a color gradient into the mix? As I progressed with my piping, I added a bit more orange to my pink each time I filled the piping bag to create a beautiful coral ombre effect. I know the color gradient didn't turn out absolutely perfect (neither are all the ruffles for that matter), but isn't it still so pretty? I just love all the texture and imperfect bits of color. Can you tell I am fairly pleased with myself? Hehehe. When I posted a preview pic to Instagram last week, the lovely Courtney of Fork to Belly pointed out they looked like ginger leis. I wholeheartedly agree! Okay, on to the tutorial section. To start, apply a crumb coat to the entire cake. You do not need to make sure everything is perfectly frosted, but the crumb coat should be just slightly thicker than normal. Unless you plan to create a petal design on the top of the cake (which would be really cool, too), ice the top of the cake before getting started. You won't really get another opportunity to smooth or swirl the top, so be sure to take care of the top and edges now. Filling the remaining portion of the bag is much easier. Simply fill a second piping bag with plain buttercream and squeeze it directly into the other bag. I only kept my piping bag about 1/2-full at all times, allowing my to change colors as I refilled and to keep things from getting too messy. To create the ruffles themselves, start about a half-inch or so down from the top of the cake. Keep the narrow end of the petal tip pointing up (the coloured portion). As you apply pressure, the buttercream being squeezed through the uneven opening of the tip will begin to curve and curl. Moving with this natural curve, make a slight zig-zag motion with the piping bag (up and down the side of the cake) as you progress around the cake. Slightly flare the narrow tip out (towards you), being sure the fat end of the tip is always touching the cake. Continue around the cake until one row is complete. To complete the cake, begin the second row under the first, allowing the top of the ruffle to overlap the bottom of the previous row. Again, by slightly flaring out the tip towards you, the ruffles will begin to overlap. As you progress and need to refill the piping bag, change up the colored portion as desired. If your piping bag gets too messy, considering swapping it out for a clean one (I didn't end up having to do so until my very last row, but it was certainly necessary at that point for me). So there you have it! A Two-Toned Ruffle Cake! The perfectionist side of me wanted to go in and re-do every single ruffle that wasn't perfect, but the creative, carefree side said "leave it." That side won. Yes, I know each ruffle isn't perfect, but isn't that the beauty of it all? It doesn't have to be perfect and I am still digging the flirty texture. I sure hope that inspires you all to give it a try! Now on to the awesome part of this post. I've teamed up AHeirloom for a giveaway!! That gorgeous, wood base cake stand that I know you've been swooning over this entire post? Yeah, it's from them. And you could win your own! THIS CONTEST IS NOW CLOSED. CONGRATS, AMANDA! Enter your information below for a chance to win a $75 credit to AHeirloom (that's worth one of their stunning cake stands!). US and Canadian residents only. The contest will run until March 8th, so be sure to enter! I'll be announcing the lucky winner next week. As a previous wedding cake maker, I've had to seriously consider the effects of fresh flowers on cakes. Not to sound overly dramatic, but if someone were to become ill after eating a cake, I bet they would blame the baker before ever thinking about the flowers that were on it. That being said, I advise that you never put the stems of fresh flowers straight into the cake. Instead, wrap the ends in floral tape and gently place them on. If need be, anchor flowers onto a cake by inserting a drinking straw first, then placing the flower stems into the straw. I got the "Okay" from my florist when selecting the blossoms on this cake, but be cautious of the blooms you handle around food. Typically flowers like roses are perfectly fine, but double check when dealing with other varieties. I wasn't sold on the idea of having a January baby at first (not that I really could have controlled it that much). I thought his birth would be too close to the holidays and that his birthdays would always be over-shaddowed by Christmas and New Years. But as I watch him light up with each new adventure and activity this season, I am glad that his first Christmas will be one he can actually enjoy (even if he doesn't remember). I may even be cured of the post-holiday blues knowing that we still have one last thing to celebrate each season - my dear, darling boy. I try not to talk too much about my son - let's face it, you are all here mostly for the cake! However, there is nothing like seeing the holidays through the eyes of a child, and this cake reflects just that: pure MAGIC. The holiday season in my twenties was nearly everything I could have wanted as an adult. I still spent and cherished each Christmas day with my family, but the weeks leading up were filled with friends, Christmas cocktails, smooches under the missile-toe with my boyfriend-turned-husband, my first grown-up tree, and hosting my own celebrations and dinner parties at our swanky townhouse. To contrast the sequins, stilettos, and champagne (not that I was ever a huge party girl or anything, but hey - it's (or was) the holidays! ), this year we went to the Santa Parade in our rubber rain boots, took Everett on his first carousel ride at the Vancouver Christmas Market, and I even had to borrow some heels from my stylish mom for Brett's work party since my current wardrobe was missing a decent pair. We spent last Friday night baking cookies with grandma and were home to tuck the little guy into bed by 8:30pm from the Vancouver Aquarium holiday party. Every single aspect of my life has been changed since having a baby. The holiday season is no exception. And while I had fun celebrating in my glamorous twenties, I have a feeling that Christmas as a 31-year-old mommy will be even better. I wasn't sure how much Everett would actually be able to absorb at only 11 months old, but I have been delightfully surprised. Watching his eyes light up when we decorated the tree and him trying to sing along to Christmas carols made my mommy heart nearly explode! We opened gifts with my parents over the weekend, and he definitely had fun with all the tissue paper. And just like they all say, he has found equal enjoyment out of playing with the boxes as his new toys (he is currently putting his new blocks into the big box that our new coffee maker came in as I type, hehe). He surely doesn't get the concept of Santa yet, but what a happy change it has already been to be celebrating the season with a little one in the house. Happy 11-months and Merry 1st Christmas, baby boy! Oh, about the cake! I almost got so carried away rambling about my little love-bug, that I nearly forget to talk about the fantastic flavours of this incredible cake. For my last cake of 2015, I wanted to create something extra special. And although the cake layers are only vanilla, they are anything but ordinary. This vanilla bean butter cake is the only white cake you will ever need. It is velvety, moist, and full of flavour! For the filling, I made my own gingersnap cookie butter then folded into a delightfully whipped vanilla bean frosting. Did you hear that? Gingersnap Cookie Butter!!!! I got hooked on Trader Joe's cookie butter years before me moved to Canada. Since we don't have TJ's up here, I thought I'd make my own. For Christmas, I whizzed up some gingersnaps in the blender and turn them into a spiced cookie spread. Instead of stopping there, I turned it into a buttercream filling. If you've been reading this blog for even just a few months, then you probably know how much I rave about Swiss Meringue Buttercream. It is so smooth and not too sweet - although fairly labor intensive. I've been making this type of buttercream ever since I ran my bakery, The Frosted Cake Shop, so I've gotten used to gently heating the egg whites and making meringue. I've always turned my nose up to American buttercream since I typically find it to be too sweet and the texture too thick. Well folks, something clicked and I have new found love for American Buttercream. They key factor? Letting it whip until light, fluffy perfection! Taking the time to let the air get worked in really lightens up the buttercream and makes it smooth enough to ice a cake. My intention was to make an elegant, snowy winter wonderland cake. I wanted it to be more glamorous than whimsical. But when my white chocolate ganache ended up being too yellow (hello Tessa, white chocolate is hardly white at all), and then when that yellowish ganache turned teal instead of ice blue (again, Tessa: yellow + blue = green), the design for the cake took a turn towards funky town. By this point, I decided to embrace my inner Willy Wonka and go all Katherine Sabbath on it. And ya know what? I'm not complaining one bit about the final results! I was inspired by some of my fellow cake artists for the design, including Lyndsay of Coco Cake Land, Clifford of Cakes by Cliff, and of course Katherine Sabbath as well as my favorite watercolour technique for the frosting. I blended in a touch of blue icing just before I was done smoothing out the cake completely so that is would be more of a marbled effect instead of just turning the cake light blue. The technicolor drip is made from white chocolate and the whole thing was topped with an array of meringues, dragees, and sprinkles. Vanilla Bean Cake I used this recipe I created for The Cake Blog - baked in three 6-inch cake pans for about 24 to 26 minutes. 1. Beat the butter with an electric mixer until very smooth. 2. With the mixer on low, gradually add in the remaining ingredients. 3. Once incorporated, turn the mixer up to medium-high and mix for about 5 to 7 minutes, or until light, fluffy, and very pale in color. Crush the cookies up in a high-powdered blender or food processor. Add in the remaining ingredients and blend until a smooth, thick paste forms. Add more or less water and powdered sugar until desired consistency is reached. Store in a glass jar in the refrigerator for at least 20 minutes before use. Re-mix the buttercream until fluffy, if necessary. Add in the cookie butter and mix until smooth. Gently heat the cream until just before a simmer. Pour over or add the white chocolate. Let sit for 20 seconds then stir until combined. *Truthfully, I heated the cream at 1/2 power in the microwave then dumped in the chocolate. The chocolate did not completely melt, so I microwaved it all again at 1/2 power in intervals of 15-20 seconds. If you decided to follow this method, be sure not to microwave either the cream or the chocolate for too long or it may seize up or burn. Meringue Kisses I used this recipe from the how-to post I created for The Kitchn, plus the seeds from 1/2 of a vanilla bean whipped in. I piped out about 2/3 of the meringue using various star tips. With the remaining 1/3, I tinted it blue, then added it to the used piping bags to create the swirls of color. 1. Trim the cakes as necessary. 2. Fill and stack the cake with the gingersnap cookie butter buttercream (more detailed instructions here). 4. Once you are nearly done smoothing out the cake, randomly swipe on the blue buttercream. 5. Continue to smooth out the cake to intregate the blue portions without blending it in completely (there should be watercolour-like patches vs. the whole cake turning pale blue). Chill in the refrigerator. 6. 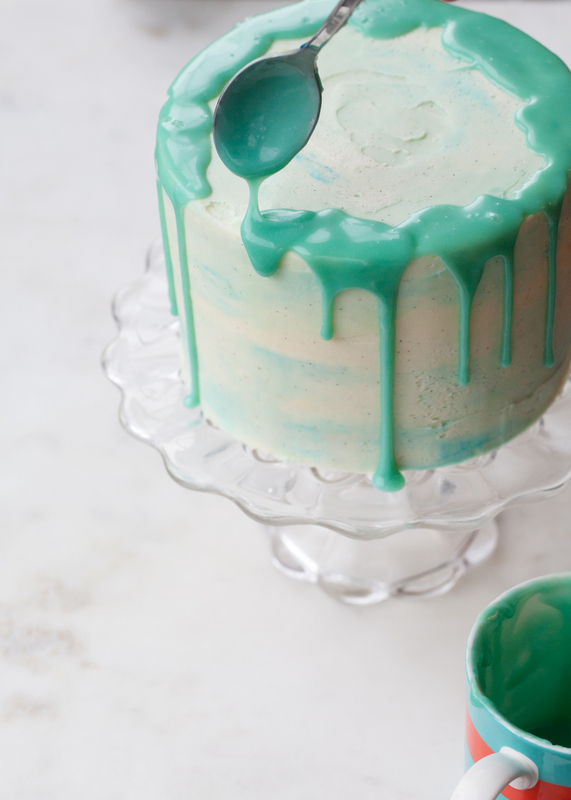 Make the white chocolate ganache glaze and tint it your color of choice. Set aside for about 10 minutes or until slightly cooled but still thick yet liquidy. 7. Begin dripping the ganache over the edges of the chilled cake. Start slow by dripping only a little bit at a time with a spoon. If the ganache runs everywhere, it's probably too hot. Try a few practice drips to determine the correct consistency/temperature (gently reheat as necessary). 8. Continue to add drips as desired around the entire cake - working in small amounts to help control the "drip." 9. Gently pour the remaining ganache into the center of the cake and smooth it out with the back of the spoon or small off-set spatula. The glaze should settle and smooth out more as it sets. If by this point the ganache is too cold, it may not smooth out. Gently re-heat as necessary. 10. 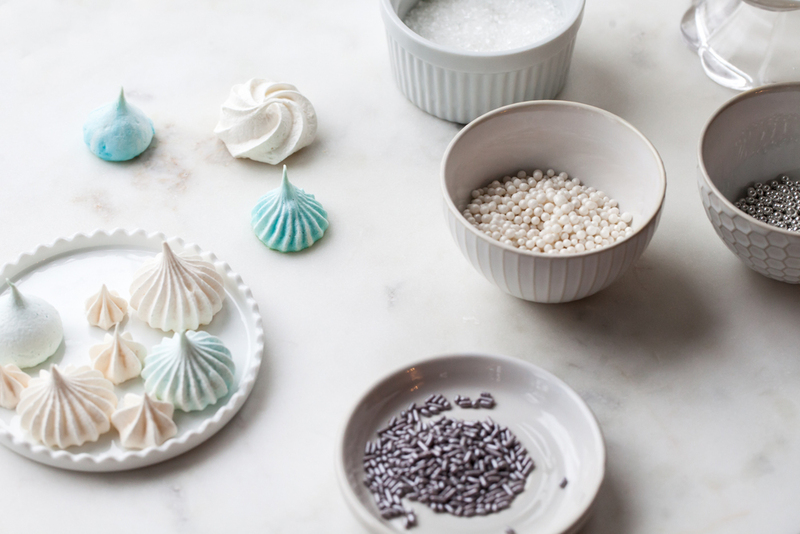 Decorate to your heart's desire with the meringues, sprinkles, etc!